The angle bar by Ridder fits invisibly into your bathroom, and is also characterized by high stability and easy installation. 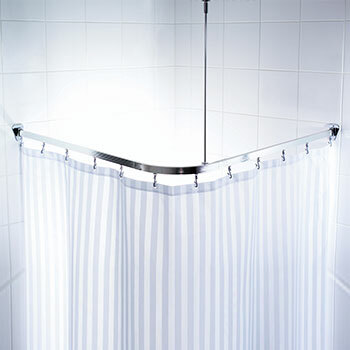 With a maximum length of 170 x 90 cm to fit the angle of any shower or bath to accurately and prevents the water leaking. Your floor will stay dry and therefore not slippery! The angled bar is made from high-quality pressed aluminium. No visible weld-seams. The non-toxic paint is powder coated and, in this way, is protected against scratches. The aluminium tubes can be shortened easily. With a diameter of 25 mm, the angled rail offers perfect stability and hold Experience the smooth gliding of Ridder's shower rings on the curtain rod on the flat angle rod for effortless opening and closing. Installation is quite simple: Without much effort, the circular shower rod is affixed to the wall with only 3 rawl plugs. The angled rod can be easily cleaned with standard cleaning products and is free from harmful substances. The foldable rod can simply be detached for cleaning; no need to loosen the screws. Let Ridder's quality wow you.